Freedom to switch from one carrier to another. Ask for more money for your SPV Orange. Fast and maintains the warranty. How to unlock my SPV Orange phone with doctorSIM? Start making significant savings on your cell phone bills by unlocking your SPV Orange from its network carrier. Once unlocked, you'll be able to use your SPV Orange on any compatible GSM network in the world. What are the benefits of owning an unlocked cell phone? The main advantages of having an unlocked SPV Orange are being able to save money by switching to another network carrier, avoiding costly roaming surcharges when in another country and increasing its resale value when the time comes to upgrade to a newer phone. How much does it cost to unlock an SPV Orange? Unlock codes are very reasonably priced and a lot cheaper than having to buy a brand-new cell phone when switching to another network. We also offer discounts and special promotions throughout the year, so make sure you visit doctorSIM.com as often as possible. The exact price to unlock your SPV Orange will appear on screen once you have completed the online request form with the information on your device. Where can I find the IMEI number of my SPV Orange? The IMEI number of your cell phone can be obtained by typing *#06# on the phone's dial screen as if you were going to make a call. Will unlocking my SPV Orange void the warranty? No. Unlocking your SPV Orange with doctorSIM will not void the cell phone's warranty because neither the software nor the hardware is impacted during the process. Can I unlock my SPV Orange if I am under contract? Yes, you can, however, unlocking the cell phone does not cancel the contract with your current network. Even though you will be able to use your unlocked SPV Orange on any compatible GSM network in the world, you will still have to pay your monthly bills until your contract expires or by paying an Early Termination Fee. Will my SPV Orange lock to the new network when I insert the SIM card? No, once unlocked your cell phone will be permanently unlocked for use on any GSM network in the world including the original operator. You will never have to repeat the process of unlocking your device in the future. Will future software updates remove the unlocking? The unlocking provided by doctorSIM will not be lost if you update the phone's software to the latest version. Continue downloading the official SPV Orange software updates as normal. Our unlocking services are totally legal. Permanently unlock your SPV Orange from home. No need to wait in line at a local store. Zero risks of harming your cell phone. Continue using your SPV Orange while awaiting your unlock code. 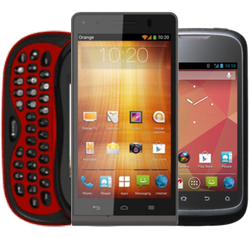 The worldwide cell phone unlocking leader for over 10 years. Fast turnaround times (within minutes to a few business days). Our customers have access to the best support via real-time chat and e-mail.